Welcome to Starlight Beads UK online bead store newsletter! Our BIG WINTER SALE is now on – up to40% off selected, pendants, beads, findings, stringing materials, designer dichroic jewellery sets. Limited stock, so buy early to avoid disappointment. Sale ends 3rd January. Back in stock – Teal 28mm hearts, the intensely popular deep purple 28mm hearts, deep purple 20mm hearts, aqua and black foil heart pendants – and more! Coming soon – pandora foil beads, new pendant designs, flat round foil disc beads…. Seasons Greeting to all our customers who have supported us through 2008! with best wishes & lots of stitch markers! Last Date for orders placed online is Friday 19th December for Christmas Delivery! It’s not too late to order…. We accept payments via PayPal and we also accept cheques and crossed postal orders. Check our terms and conditions for more information. 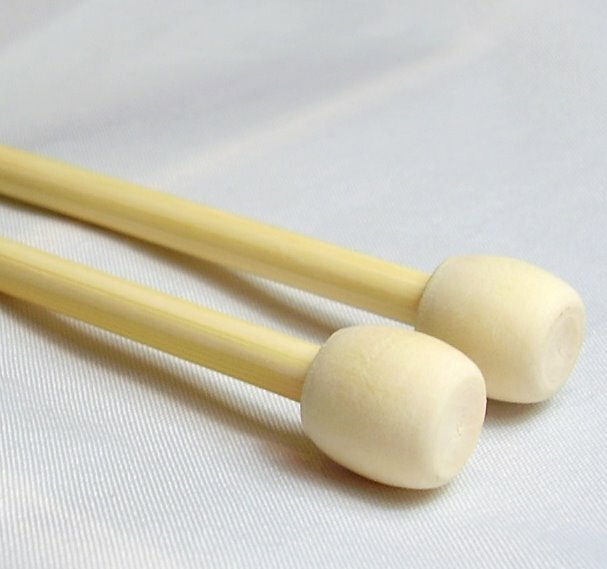 Our lightweight knitting needles are comfortable needles made from natural high quality bamboo. This makes them warmer in winter than metal needles, and because they are lightweight won’t hurt your hands like some metal needles can. Super smooth bamboo needles are just a pleasure to knit with! Available in a range of sizes in single point needles, double point needles, circular needles, and coming soon crochet hooks. Beads, Pendants, Magazines & Christmas Delivery! We’re taking orders now for the new January 2009 edition of Beads & Beyond magazine which is available from Friday 12th December. Place your order online with us today at a reduced price of £3.25 (RRP £3.95) and we’ll dispatch as soon as we get the magazine (mid week). This month’s issue is likely to be extremely popular and has some great project ideas including adding some sparkle and bling to your projects. We have a few back copies of the Beads & Beyond Magainze also at a reduced price of £3.25. We’ve fixed some of the broken links on the front page to make navigation easier around the site. So why not visit today and have a look at our new beads and pendants. Last orders for Christmas Delivery will be 19th December for the UK. However, please order early to ensure we still have stock available. Remember also, we have additional postage that you can purchase if you wish to have recorded or special delivery on your order – simply add to you cart before you checkout. 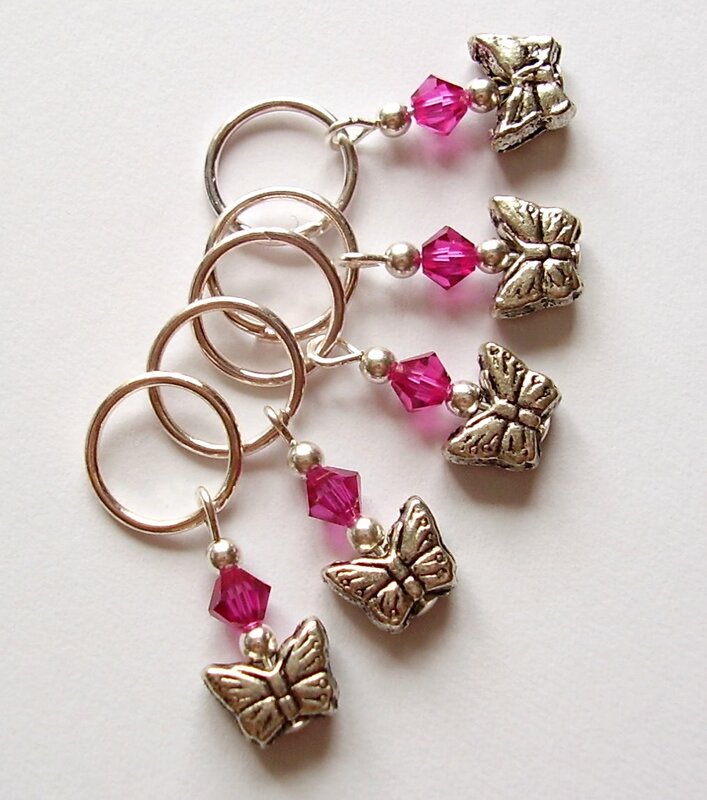 New Stitch Marker Designs Added….and some back by popular demand! The 4mm range of markers has been extending to include flowers, butterflies, squares, rounds and hearts. The 7mm range of markers has new ‘the must have’ bead this season, the butterfly. Also fish, turtles, flowers, squares, hearts, rounds and assorted shapes. Plus…there is only one set of Russian Doll Markers left….we hope to have these in stock again in 2009. We still have some gift sets left, they make great stocking fillers plus cupcake candles which smell delicious! Bamboo knitting needles, DPN and circular needles, plus bamboo crochet hooks. Look out for our advert on Ravelry Marketplace from tomorrow! Christmas orders – the last date for ordering in time for Christmas is Friday 19th December. However, I recommend that you order sooner than this, due to current demand, so that your order arrives with you in good time for Christmas! Beads & Beyond Magazines reduced from £3.95 to £3.25 per issue, including current issue and all back issues whilst stocks last! Bamboo knitting needles, DPN and circular needles! Knitting hampers, fabric gift bags and sets – choose your own bag and fill it with goodies from the website (great stocking fillers), amazing cupcake candles, wax melts and bath melts! 10% off Beads & Beyond Magazine…sign up for our newsletter to find out more. Well here it is….the first pictures of the stand for Atomic Knitting featuring Starlight Beads at the Creative Stitches and Hobbycrafts Show in October 2008 at Cardiff International Arena. 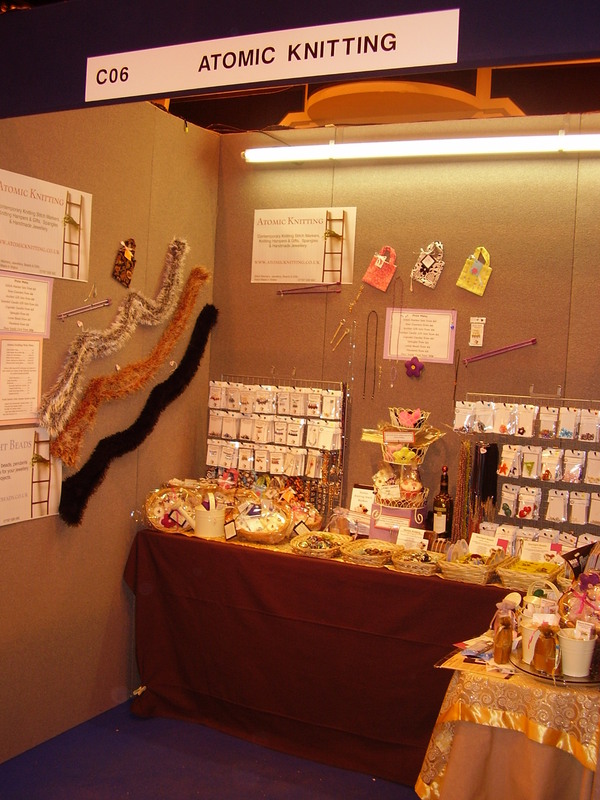 There was a good range (for the size of the stall) of stitch markers, knitting hampers & gifts, cupcake candles, pendants, pendant cords, strung beads, wine bottle capes and ties, knitted scarves, spectacle chains, fabric party bags….and so much more! I met some great customers, some from Ravelry – hey guys :), those that have purchased from the website, and new customers who hadn’t had the opportunity to find us on the web. Other exhibitors and designers that had stalls at the show included our fabulous show neighbours, Inkwell Stamps, which include welsh stamps for card making :), Phase Patch Crafts, Rohana Stoddart and a demonstration of PMC, Ray Skene with a demonstration of glass bead making, Janna Hodgson with unusual enamel jewellery, Rachel Johns totally fab Extreme Knitting and designer and editor of Beads & Beyond magazine Joan Gordon. Buy now as this offer is strictly limited this week only! There are many more great savings on pendants throughout the online store. Back in Stock.. 15mm foil heart beads, black phone lariats, black starfish pendants….selling fast, large centre hole hearts, and more…. Welcome to Atomic Knitting Stitch Markers & Knitting Accessories! Funky Designer crochet and knitting stitch markers, beaded row counters, hand made pin cushions and knitting jewellery. Scottish Dichroic Pendants & Earring sets, from designer Alison MacVicar (see below), keep your needles in pairs with our charming Knitting Needle Holders, and your pins in place with Funky Pin Cushions. 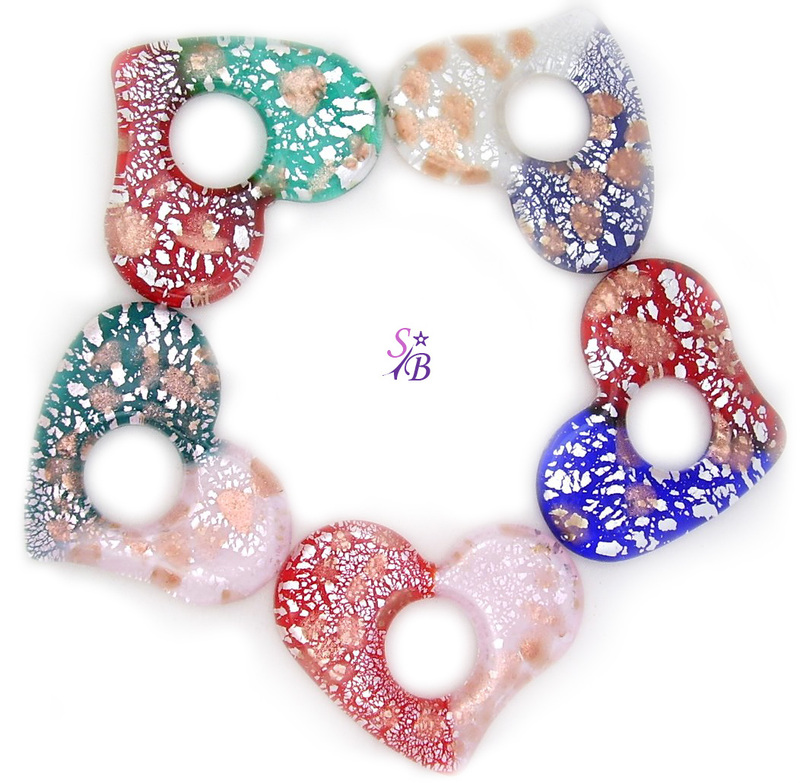 10% off Beads & Beyond Magazine, last few days remaining SALE! Summer 08 Collection…sign up for our newsletter to find out more. We ship to UK, US, Canada, Europe and Worldwide from £1 – simply choose your destination country when you check out. Don’t forget you can meet us at Cardiff International Arena between 30th October – 1st November at the Creative Stitches and Hobbycrafts show, where we’ll be lauching our knitting hampers, which are pure indulgence and make great gifts for knitters. If you can’t make it to the show, you’ll be able to buy from the website from 2nd November, however numbers are strictly limited and will be offered on a first come first serve basis. Have a look at our knitting charm bookmarks ! Alison graduated from Glasgow School of Art in Jewellery Design and has refined the techniques of combining dichroic glass and fusing glass to produce stunning pendants and earring sets. No two pieces are ever identical, even if the same materials are used, as small changes in firing time or temperature will result in different colours, textures and finishes. Alison creates her beautiful handmade pendants in her studio in Stewarton, East Ayrshire, Scotland. Each pendant or set is presented in a black linen gift box and prices start from £20. As featured in Knitting Magazine, Quick & Crafty Magazine, Simply Knitting and Let’s Knit Magazine. We also support Brenda Dayne’s Cast-On: A podcast for knitters. Why not have a listen to the latest episode? Get making jewellery in time for Christmas! We’ve also got several back issues, so if you’ve missed a copy, why not save on postage and order any Beads & Beyond Magazines that you’ve missed? In the current issue there are several projects including…. Sue Simmons shows us how to make sparkly and easy earrings for your big night out! 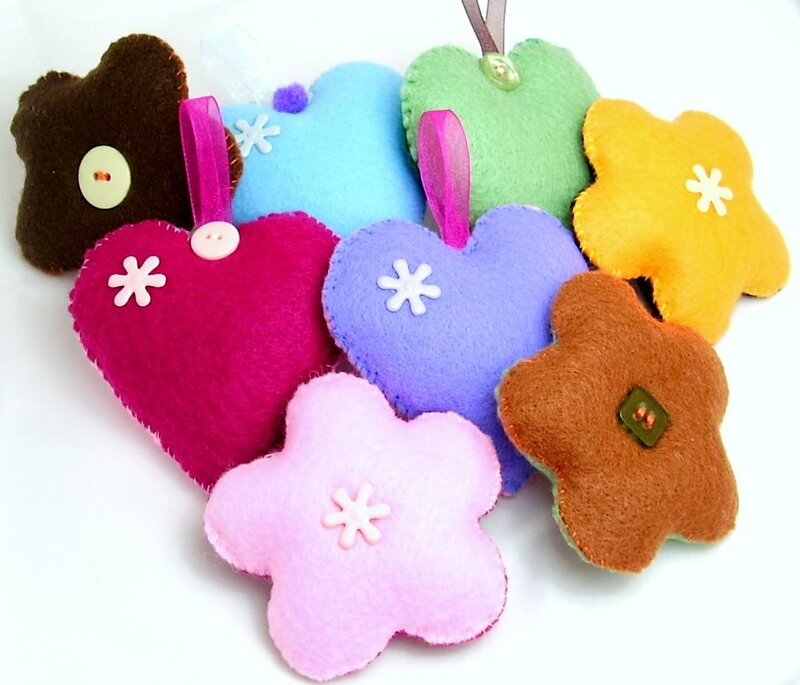 Funky Felt Pin Cushions ! Handstitched by Atomic Knitting, these fun pin cushions are a useful addition to any sewing or knitting kit. Designed to co ordinate with our stitch marker designs. Prices start at £3.50. The summer stitch marker collection is still 20% off at £3.60 per set – bargain! This offer will close in the next 2 weeks. New Beads and Pendants added today ! Welcome to Starlight Beads UK online bead store! Contemporary focal beads, pendants and beading supplies for your jewellery making projects. Special Offer: Beads & Beyond Magazines back issue cover prices discounted from £3.95 to £3.55 that’s a 10% saving! October issue on sale now – and Starlight Beads is featured in the website review! Presenting the ‘Magical Millefiori’ collection of stitch markers, which are released today. Ok they don’t really have magical powers, but they might help you with increasing and decreasing stitches on your lastest project! This collection is limited to only 6 designs, with one set available of each. Also, the summer stitch marker collection is currently 20% off at £3.60 per set – bargain! Our collections and gift sets make ideal gifts for your knitter friends and relatives, or why not treat yourself? The preparations for our stand at the Cardiff CIA Creative Stitches and Hobbycrafts Show are coming along. The new adverts with the stand details have been sent out to the knitting magazines, and there’s still time to get your 10% card from us before the show, which is free with any purchase from the website . Our packaging has been updated and is now able to be integrated into modern retail settings a lot easier. We hope you like it too! As well as stitch markers and row counters, we have put together some amazing knitting gift sets and knitting hampers. Just the finishing touches and they will be ready for the show. There will be gift sets to match all budgets from £5 upwards. If there are any left after the show, they will be available to purchase on the website . Why not visit Atomic Knitting today? We’re busy preparing for our first show in October, which will be in the Cardiff CIA from 30th-1st November at the Creative Stitches and Hobbycrafts Show. If you make a purchase from the Starlight Beads website in September we’ll send you a 10% discount card to use at the show. There will be more details about the show next month. Special Offer: Beads & Beyond Magazines back issue cover prices discounted from £3.95 to £3.55 that’s a 10% saving! There’s a delay in delivery of the latest issue to Starlight Beads and other retailers, but we will have them by Friday so Pre-Order your copy of October Issue 13 today. Back in Stock…large starfish pendants….selling fast, large centre hole hearts, triangle pendants are back!, ready made heart charms with Swarovski Crystals and more…. Atomic Knitting – Our first show! We’re busy preparing for our first show in October, which will be at the Cardiff CIA from 30th-1st November at the Creative Stitches and Hobbycrafts Show. Our new collections will be launched at the show in October, and for our valued customers, there’s an opportunity to purchase early as we’ve launched our Autumn Collection earlier than usual this year. The collection includes some fabulous hand made fabric gift bags, pin cushions and bookmarks teamed with our favourite stitch marker collections. The collection is limited at the moment to only 6 designs and there’s just one gift set available in each set – so don’t delay! These sets make ideal gifts for your knitter friends and relatives, or why not treat yourself? Special Offer: 24% off Beads & Beyond Magazines – Plus get your September Issue of Beads & Beyond Magazine (out on Thursday 14th August). Only whilst stocks last! New Arrivals…September Issue 12 Beads & Beyond Magazine, leaf infinity pendants, encased swirl heart small pendant, black & silver turtle pendant, lavender,gold, black & brown tigertail by the reel & 3m lengths, tibetan silver bead caps, stunning flower pendants , pink, blue and black thonging , black and brown organza ribbon…. Back in Stock…large starfish pendants, large centre hole hearts in black & aqua (hard to get), millefiori heart pendants, triangle pendants are back!, ready made heart charms with Swarovski Crystals and more…. We have some new beaded row counters, limited edition cats head stitch markers (pictured above), a new cats eye bead collection and the range includes crochet markers and row counters. There is only one set of David Christensen cane bead stitch markers left. We’re busy preparing for our first show in October, which will be in the Cardiff CIA from 30th-1st November at the Creative Stitches and Hobbycrafts Show. If you make a purchase from the Atomic Knitting website in August we’ll send you a 10% discount card to use at the show. There will be more details about the show next month. Great British Yarns are online and mail order stockists of a wide variety of beautiful knitting yarns from British companies and producers. They stock a variety of British yarns and accessories such as buttons and needles from Patricia Baggott and stitch markers from Atomic Knitting. If you are looking for knitting patterns try they’re selection from Rowan and independent designers such as Patricia Baggott and Sandy of Proud Yarns.Great British Yarns support industry from around the British Isles wherever possible. Smalls Crafts are based in South Wales and stock a variety of knitting and crochet yarn, accessories and patterns to cross stitch kits and embroidery threads. There are knitting needles, sewing needles, crochet hooks, crochet threads and new items being added all the time. 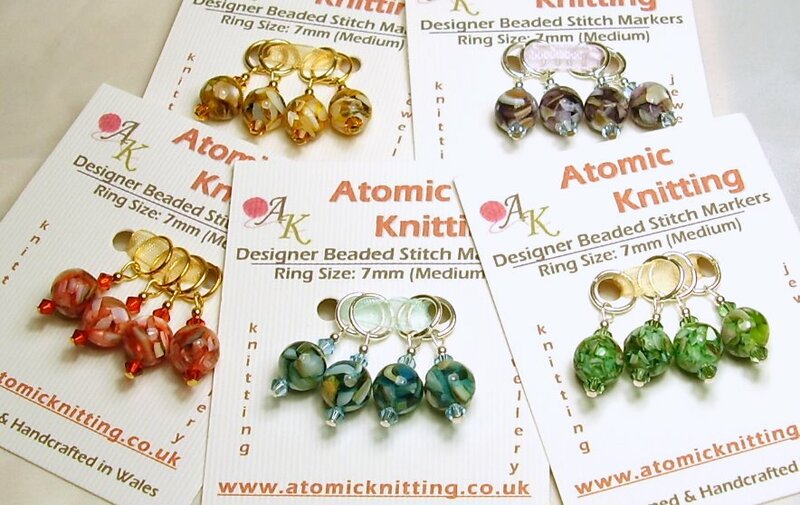 Check out the stylish new knitting stitch markers and crochet stitch markers by Atomic Knitting, designed and handcrafted in Wales. We’re featured in two magazines this month! Plus…If you like beading and making your own jewellery, we thought we’d introduce you to our sister website- Starlight Beads . You can shop at both websites with one cart, paying just one postage fee…why not try it out? New Arrivals…August Issue Beads & Beyond Magazine, leaf infinity pendants, encased swirl heart small pendant, black & silver turtle pendant, lavender,gold, black & brown tigertail by the reel & 3m lengths, tibetan silver bead caps, stunning flower pendants , pink, blue and black thonging , black and brown organza ribbon…. Take a look today at Starlight Beads …..
Our new look website is up and running, and we’ve added more pendants, including some stunning flower pendants , triangle pendants are back !, pink, blue and black thonging , black and brown organza ribbon , gold colour tigertail , ready made heart charms with Swarovski Crystals and more…. The weather has improved no end…a sweltering week means the early launch of the summer stitch marker collection. These unusual shell beads were bought from the Chepstow Bead Fair in March and are perfect for the summer knitter. Available in 5 pastel shades and teamed with Swarovski Crystal bicones, these are really pretty markers. Over the past year the bead site has been going well and has grown a good customer base. There’s been less luck with the eBay store which lost it’s powerseller status (mainly due to repeat customers buying direct) and sales basically stalling. eBay have changed the visibility of stores, and unless you have a high ratio of auctions constantly running, then this option becomes less and less viable. For the reasons above, the decision has been made to close the Starlight Beads eBay store, and move the listings to Bohobeads eBay store. This should make the management of the beads & pendants much easier on eBay, and of course, the best option for customers is to buy direct. The weather finally seems to be getting warmer, which has the effect of making the weeds in the garden grow faster! After spending a day out there trying to remove most of them and planting some more lavender, my efforts seemed to have made a little improvement, but there’s more work needed yet. And There’s always tomorrow…. 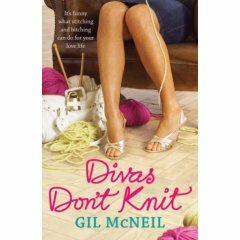 I’ve just finished reading a great knitter story by Gil McNeil – Divas Don’t Knit. I grabbed a copy right before going on hols, and just finished it yesterday. her grandmother’s wool shop in a small seaside town. Purl-one… But it’s not going to be easy with two young sons to cope with, an A-list actress moving into the local mansion and a knitting group addicted to cake. I have to say that I’m rather taken with her knitting books, and enjoyed reading this one. I love her website too – the shop on the main page looks perfect…I wonder where I can find one like that! The sequel isn’t out yet, but as soon as it is, I’ll be getting a copy. Highly recommended! Wales are 6 Nations Grand Slam Winners! Amazing atmosphere for the last game – well done boys! The Island Collection was featured in the March 08 Issue of Quick and Crafty magazine as a coveted knitting accessory, and is selling fast, with only a few sets left. The collection will be closing at the end of March. The Russian Doll Collection has flown out of the shop! This incredibly cute and popular babushka collection in available in a range of colours and features a clasp to hold all the markers together when not in use and can also be used to clip directly on to a stitch. Back after a long break from blogging! It’s been a long time since I last posted…..but that’s because I’ve been busy busy busy! So what’s new…where am I now? Well, since the last blog date, as well as selling handmade jewellery, I’ve also set up a bead & pendant online store called Starlight Beads UK. As you can imagine, making jewellery means that you get through and seek out, lots of beads, more really than can be used…hence Starlight Beads UK. So beads and pendants can be bought direct online or via the eBay store. You can see an advert for Starlight Beads in Beads and Beyond Magazine this month. In tandem to Starlight Beads, the stitch markers and knitting jewellery also have their own website and advertising. The premium stitch markers & row counters are sold under the Atomic Knitting brand on their own website, with appearances in the Bohobeads eBay store, and also on Etsy. Wholesale stitch marker options are also available through the website. Atomic knitting is advertised in Simply Knitting magazine and Let’s Knit. We were also featured in the March issue of Quick & Crafty magazine with our Bahamas stitch markers which are part of The Island collection.